Rodney C. Wakeman, co-owner, vice president and director of Wakeman Funeral Home, Inc., Saginaw, was recently elected as Recording Secretary, an Executive Committee position of the Michigan Funeral Directors Association, during the association's annual convention held in Lansing. He is scheduled to become president in the 2018-2019 term. Wakeman returns to the MFDA Board of Directors, having previously served six years as District Director between 2005-2011. The Michigan Funeral Directors Association is the oldest funeral directors association in the country. Additionally, Wakeman was recently re-appointed by Governor Rick Snyder to the Michigan Board of Examiners in Mortuary Science, the state's regulatory board that oversees nearly 750 funeral homes and approximately 2,100 mortuary science licensees. The Board of Examiners in Mortuary Science is comprised of six professional members and three members from outside of funeral service. The board has statutory authority to assist the Department of Licensing and Regulatory Affairs (LARA) on matters of individual licensees, funeral establishments, apprenticeship licensees and more. Wakeman has served on the Board of Examiners in Mortuary Science since 2011, the past year as its chairman. Okemos, Michigan – Rodney C. Wakeman, co-owner and director of Wakeman Funeral Home, Inc. in Saginaw was elected chairman of the Michigan Board of Examiners in Mortuary Science at its October meeting held at the Department of Licensing & Regulatory Affairs (LARA) state office building. Wakeman was appointed to the board in 2011 by Michigan Governor Rick Snyder. The Michigan Board of Examiners in Mortuary Science is comprised of six licensed funeral directors and three individuals outside of funeral service and was created under Article 18 of Public Act 299 of 1980, as amended to license and regulate the practice of mortuary science and funeral establishments in Michigan, which currently includes approximately 734 funeral homes, 2,101 mortuary science licensees, four courtesy licensees, and 79 resident trainees state-wide. Wakeman's other professional credentials include member of the Michigan Mortuary Response Team (MiMORT), a cooperative mass casualty response team between the State of Michigan and members of the Michigan Funeral Directors Association (MFDA); past board member of the MFDA and several of its committees; and past president of the MFDA District 7. Locally, Wakeman serves as president of the Valley Lutheran High School Foundation, is a member of the Lutheran Education Advancement Plan (LEAP) implementation team in the Great Lakes Bay Region, is a former member of the Board of Elders at Holy Cross Lutheran Church, and is past president of the Saginaw Downtown Lions Club. He is also owner of Great Lakes Media Services in Saginaw where he provides photography and writing services to businesses and media outlets. History buffs and local residents alike have a new book to add to their library. Saginaw resident, historian and author, Roberta M. Morey, has written a new book on local history, Legendary Locals of Saginaw, in which she provides details of individuals and business and industry, past and present, who have helped make their mark on Saginaw, and Wakeman Funeral Home and its directors are among those listed. The book opens with Morey providing a brief historical accounting of Saginaw’s early settlers before embarking upon naming and detailing numerous residents who have helped make Saginaw over its notable history. Identified throughout as Community Leaders, Artists, Musicians and Entertainers, Educators and Communicators, Businesspeople and Professionals, Athletes, and Heroes, the 128-page book brings to life the many people of Saginaw, past and present. "It is with extreme honor that noted local author and historian, Mrs. Morey, has written about some of the history of our funeral home, including our late father, Harold, in her book," said Rodney Wakeman, co-owner of Wakeman Funeral Home. "It was confirmed to us just ahead of publication that we were featured in the book," said Brian Wakeman, co-owner and manager of the funeral home. "We are grateful to Mrs. Morey that she included us among so many other great people and businesses, past and present, that make up Saginaw's history." The funeral home is featured in the Businesspeople and Professionals chapter on pages 82 and 83. Roberta M. Morey, a retired elementary teacher, has authored three previous books with Arcadia Publishing. She became interested in local history after acquiring a large collection of postcards depicting early Saginaw scenes. The book is available online, with local booksellers, and through the publisher, Arcadia Publishing. Brian and Rodney Wakeman recently made a guest appearance and the funeral home served as the backdrop for a local credit union television commercial. The segment was shot in mid-October and is currently appearing on-air. (Left) We receive instructions regarding our part of a television commercial that we were asked to participate in, which was recorded in front of our funeral home the morning of Friday, October 11, 2013. (Right) After a few run-throughs of our lines, our "confidence" shows in our expressions. Okemos, Michigan – Rodney C. Wakeman, co-owner and director of Wakeman Funeral Home, Inc., in Saginaw, was elected Vice Chairman of the Michigan Board of Examiners in Mortuary Science at the board’s October meeting held at the Department of Licensing & Regulatory Affairs (LARA) state office building. The Michigan Board of Examiners in Mortuary Science was created under Article 18 of Public Act 299 of 1980, as amended to license and regulate the practice of mortuary science and funeral establishments in Michigan. The Board works with the Licensing Division of the Corporations, Securities & Commercial Licensing Bureau of LARA to oversee the practice of approximately 751 funeral homes, 2,135 mortuary science licensees, and 82 resident trainees state-wide. His other professional credentials include member of the Michigan Mortuary Response Team (MiMORT), a cooperative mass casualty response team between the State of Michigan and members of the Michigan Funeral Directors Association (MFDA); past board member of the MFDA and several of its committees; and past president of the MFDA District 7. Locally, Wakeman serves as president of the Valley Lutheran High School Foundation, is a member of the Lutheran Education Advancement Plan (LEAP) implementation team in the Great Lakes Bay Region, the Board of Elders at Holy Cross Lutheran Church, and is past president of the Saginaw Downtown Lions Club. He is also owner of Great Lakes Media Services in Saginaw where he provides photography and writing services to business and media outlets. Rodney C. Wakeman, CFSP, co-owner and director at Wakeman Funeral Home, Inc. in Saginaw, recently attended the 134th annual convention of the Michigan Funeral Directors Association in Detroit where he was honored for 25 years as a licensed funeral director in Michigan. Wakeman was presented with a commemorative pin and a certificate indicating his dedication to his profession during an honors reception by MFDA Immediate Past President Ronald Karelse, CFSP. Wakeman graduated from Wayne State University School of Mortuary Science in Detroit and earned his Mortuary Science license in 1988. He is Board Certified from the International Conference of Funeral Service Examining Boards and holds a Limited Life Insurance License from the Basic Life and Health Insurance Institute. In the years following licensure he has earned voluntary continuing education credentials, including, Certified Funeral Service Practitioner and National Certified Bereavement Facilitator designations. In 2012 he was national runner-up for the American Funeral Director magazine Funeral Director of the Year award. In 2011 he was appointed by Michigan Governor Rick Snyder to a four-year term on the Michigan Board of Examiners in Mortuary Science. In 2009 he served as the original funeral director to help in research and development of the WNEM TV5 on-air and online death notice platform. He is past president of the Michigan Funeral Directors Association District 7 and then served six years on the board of the Michigan Funeral Directors Association as District 7 Director. He has served on multiple committees of the Michigan Funeral Directors Association, including the Public Information Committee, Michigan Mortuary Response Team, Convention Rules Committee, Disaster Committee, and Legislative Committee. In his community, Wakeman serves on the Board of Elders at Holy Cross Lutheran Church, is past president of the Saginaw Downtown Lions Club where he was honored as the first recipient of the club’s Lawrence A. Loos Lion of the Year Memorial Award, is past Chairman of the Valley Lutheran Alumni Association Scholarship Committee and currently serves as President of the Valley Lutheran High School Foundation. The Michigan Funeral Directors Association is the oldest association of funeral directors in the United States. Founded in 1888, MFDA is dedicated to promoting the professional character and education of funeral service practitioners and the maintenance of high professional ideals of public service among its members. November 27, 2012 - American Funeral Director magazine, a leading funeral trade publication in the United States, recently concluded a national competition among funeral professionals for Funeral Director of the Year. 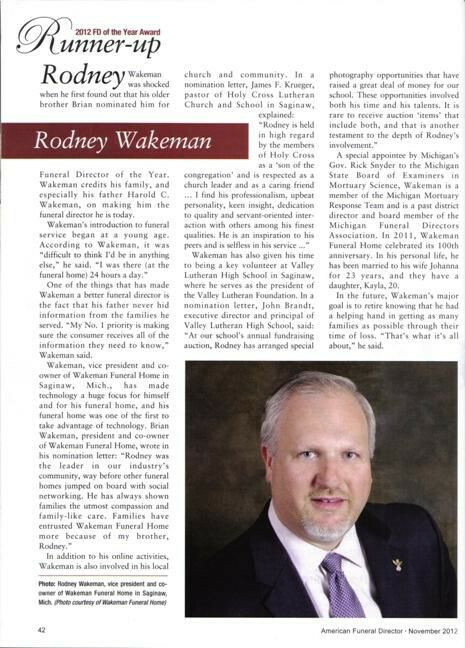 Rodney C. Wakeman, co-owner of Wakeman Funeral Home, Inc. in Saginaw, was selected as runner-up for the award and featured in the publication’s November issue. Wakeman’s brother and business partner, Brian Wakeman, secretly submitted materials to the magazine on his behalf earlier this summer. Wakeman was notified in September that he was selected as a finalist and his feature appearance in the November issue confirmed his runner-up status. The annual award program is open to all funeral professionals who have been employed as a licensed funeral director for a minimum of one year and encompasses all funeral director job titles. Judging criteria was based on number of years in position, community involvement, role model for funeral service, innovative approach to funeral service, the display of outstanding business acumen in sales/marketing/customer service, and demonstration of a compassionate approach to working with customer families. Wakeman graduated from Wayne State University School of Mortuary Science in Detroit and has been a licensed funeral director since 1988. In 2011, Wakeman was appointed by Governor Rick Snyder to the Michigan Board of Examiners in Mortuary Science, the state’s governing board for all funeral homes and funeral directors. He currently serves on the Michigan Mortuary Response Team, a cooperative effort between the State of Michigan and the Michigan Funeral Directors Association, as well as the Public Information Committee of the Michigan Funeral Directors Association. He is president of the Valley Lutheran High School Foundation and serves as Elder at Holy Cross Lutheran Church. He earned voluntary continuing education certifications from the Academy of Professional Funeral Service Practice and American Academy of Bereavement. He served as the original funeral director to assist WNEM TV5 in research and development of their on-air death notice program in 2009 and continues to serve as a consultant for updates to the program. In 2001, he launched the area’s first funeral home website and has since introduced funeral webcasting and tribute videos to his client families. In 2009, he added several new technologies to their upgraded website, including, free online grief support and daily email affirmations for consumers seeking help. He served on the board of the Michigan Funeral Directors Association as District 7 Director from 2005 to 2011. He has served as past president of District 7 of the Michigan Funeral Directors Association, and the Saginaw Downtown Lions Club. Wakeman also serves as contributing photographer and writer with The Township Times newspaper. New Orleans-based business publication CityBusiness publishes article on the loss of daily printed obituaries at The Times-Picayune; sources Wakeman for how firm addresses issue with community. ﻿Link to article reference﻿. Full article is below. Like many funeral directors in the New Orleans area, Constance Selico, owner of Murray Henderson Funeral Home in Algiers, is wondering what will happen to her business when The Times-Picayune cuts its print schedule to Wednesday, Friday and Sunday this fall. Selico doesn’t make money helping grieving families write obituaries for the paper directly. Like many homes, she lets her customers fill out a form, organizes the information and passes along only what The Times-Picayune charges to print obituaries to her customers. But Selico said daily print obituaries are her main form of advertising outside of customized paper fans and calendars handed out at area churches every year. Many of Murray Henderson’s potential customers are senior citizens accustomed to scanning the obituaries in a daily newspaper, she said, with few reading the notices online. The Times-Picayune will continue to publish obituaries every day on its website, nola.com, but daily obituaries will cease to exist in print. “Some people are not computer literate yet. What are they going to do?” Selico said. The answer for Selico and other funeral home directors may be in Michigan. Funeral home directors there faced a similar problem three years ago when Advance Publications, which also owns The Times-Picayune, announced it would reduce the publishing schedule of the papers it owns there. “We were a little bit up in arms,” said Rodney Wakeman, vice president of Wakeman Funeral Home in Saginaw, Mich. “You can prepare for a service but if you can’t get the word out it’s not going to help the family with visitors. That was a considerable problem for us,” Wakeman said. Within weeks, a local television station, WNEM, asked Wakeman and other funeral directors to help them with broadcast obituaries daily. Today, customers can pay $100 to have an obituary and a photo broadcast on WNEM three times a day as well as posted to ObitMichigan.com, an affiliate website the TV station owns and operates. Wakeman said many of his customers now request TV obituaries over print. Al Blinke, vice president and general manager at WNEM, said the model has generated interest throughout Michigan and is particularly successful in areas without a daily newspaper. “Newspapers charge an arm and a leg. We made it affordable,” Blinke said, adding that the station is open to licensing its proprietary website software to interested televisions stations. The price to print an obituary in The Times-Picayune has risen from about $1 per line four decades ago to $6.90 per line today. It costs about $92 more to print a photo. Kelly Rose, advertising director for The Times-Picayune, declined to comment on how changes to the paper’s print schedule would affect obituary print schedules and pricing. Boyd Mothe Jr., vice president of Mothe Funeral Homes in Metairie and a Louisiana Funeral Directors Association board member, said he and others are interested in exploring TV obituaries as a replacement medium if it provides consumers quality obituaries at a competitive price. Mothe said he’s planning a July meeting between association members and The Times-Picayune staff members to discuss the changes and options for maintaining obituary service. “We’re developing a plan of action. I think it’s going to be a conversation that’s going to be ongoing,” Mothe said. John Cruse, general manager of WGNO-TV 26, the New Orleans ABC affiliate, said the station would be interested in rekindling a pilot obituary broadcast program it ran between November 2010 and January 2011. Cruse said the program generated interest from large funeral home operators in the area but fizzled when operators wanted to see more time slots for obituaries without added cost. He declined to name partners that participated in the project and how much the station charged per obituary for competitive reasons. The station charged funeral homes production costs to run about eight obituaries in a two-minute space after the 11 a.m. news. Cruse noted New Orleans funeral directors wanted to see obituaries run more frequently without added cost, a model that works better in a smaller market where news content is harder to come by. “They can take the last five minutes of the newscasts and run obituaries. We hesitate to do that,” Cruse noted, adding that consumer interest in running a timely obituary might encourage more local funeral homes to buy into the program now. Joe Cook, general manager of WVUE in New Orleans, the local Fox affiliate, said the station would not be interested in broadcast obituaries, mostly because the market is too large to adequately serve. About 1.6 million people live in the WVUE service territory, which includes two counties in Mississippi. “I’m not sure that anybody would want to sit and watch a whole program of obituary after obituary,” Cook said. Some larger area funeral home operators say they are more interested in growing their online obituary business. Phil Sprick, vice president of marketing for Stewart Enterprises Inc., which operates four funeral homes in the New Orleans area, said its own digital obituary service is competitive with what nola.com has to offer. Stewart publishes obituaries online through Tributes.com, a service that allows families to publish unlimited text and a photo. Friends can write in an online guest book and light digital candles. For an additional cost, families can add video and unlimited photos. The website also offers a revenue stream newspaper obituaries do not. Tributes.com charges $20 wholesale for basic online obituaries, but funeral homes have the option to set their own retail price for the service. Stewart builds the cost of the online obituary into its professional services fee. Sprick said the main challenge for Stewart is encouraging its customers to seek out the site and use it. “Someone has to go online, think about looking through it and then they go through a list of people online,” Sprick said, adding that the company intends to take out print ads that encourage customers to visit Tributes.com this fall. Mothe and Selico still think most of their customers will prefer print obituaries because of their reach. Acquaintances can read the death section over their morning coffee or while waiting for a table in a restaurant. They said they will advise families to run obituaries several days before a service. Both plan to accommodate families that want to schedule services for the days immediately following The Times-Picayune print days as best they can. “I think you’re going to reach for the paper for three days a week and read about a lot of funerals that already happened,” Mothe said. On Wednesday, June 29, 2011, Michigan Governor Rick Snyder appointed Saginaw funeral director Rodney C. Wakeman to the Michigan Board of Examiners in Mortuary Science. The nine-member board is comprised of six professionals and three lay persons, and its powers are authorized under Article 18 of Public Act 299 of 1980 of the Michigan Occupational Code. The board’s function, through the assistance from the Licensing Division of the Bureau of Commercial Services of the Michigan Department of Licensing and Regulatory Affairs, is to protect Michigan consumers from reported unlicensed activity, the administration of the training and testing of students at accredited mortuary colleges, and oversight of the state’s approximately 2,122 mortuary science licensees, 2 funeral directors, 88 resident trainees, and 747 funeral homes. Snyder also appointed Stephen J. Linder of the Lansing area. Linder is managing partner of the Sterling Corporation, a Lansing-based public relations firm, and represents the general public. "I am confident these two individuals will bring insight and innovative ideas to the board," Snyder said. Wakeman’s four-year appointment expires June 30, 2015, and is subject to the advice and consent of the Senate. Wakeman also currently serves as president of the Valley Lutheran High School Foundation; a member of the Michigan Mortuary Response Team (MI-Mort); research, development and maintenance consultant to WNEM TV5 for their on-air and online death notice service; and member of the Board of Elders at Holy Cross Lutheran Church. He is a life member of Saginaw County Sports Hall of Fame, and is a contributing photographer for The Township Times community newspaper and University of Michigan Football. Wakeman has voluntarily received continuing education certifications from the Academy of Professional Funeral Service Practice and the American Academy of Bereavement. His previous boards and committee work includes, past president of the Michigan Funeral Directors Association (MFDA) District 7; past president of the Saginaw Downtown Lions Club; past chairman of the Valley Lutheran High School Alumni Association Scholarship Committee; past member of the Public Relations, Disaster, and Legislative Committees of the MFDA; and recently concluded six years of service on the MFDA Board of Directors. Wakeman is co-owner, vice president and director of Wakeman Funeral Home, Inc., 1218 N. Michigan Ave., Saginaw, and is in business with his brother, Brian D. Wakeman. LANSING, Mich. - Gov. Rick Snyder today, June 29, 2011, appointed Stephen J. Linder and Rodney C. Wakeman to the State Board of Examiners in Mortuary Science. The board was created to license and regulate the practice of mortuary science and funeral establishments in Michigan. Linder, of Okemos, is managing partner of the Sterling Corporation, a national public relations, issues management and fundraising company based in Lansing. He previously owned Linder & Associates, a political fundraising firm. Linder has served as senior staff on several statewide campaigns as well as worked in executive positions for the Michigan Manufacturers Association, Michigan Chamber of Commerce and Auto Dealers Association. He earned a bachelor's degree in communication arts and sciences from Michigan State University. Linder represents the general public and replaces Donald Duford. Wakeman, of Saginaw, is co-owner and vice president of Wakeman Funeral Home, Inc., and has been a licensed funeral director for 23 years. He is also a technical consultant for the Meredith Corporation and WNEM TV5, where he helped launch One Service, an on-air and online obituary notification service. Wakeman was elected to the Michigan Funeral Directors Association Board of Directors in 2005. He earned a bachelor's degree in mortuary science from Wayne State University. Wakeman represents professionals and replaces Thomas Lynch. The appointees will serve four-year terms expiring June 30, 2015 and are subject to the advice and consent of the Senate. Social Networking: Should your funeral home use it? All business owners look for new, productive ways to engage established and potential clients. Many firms have advertised in the traditional static print medium (one that does not change) of newspapers, phone books, on calendars, pens and more. Others have ventured out into the broadcast medium of radio or television. A tool many businesses have used for years for self-advertising and to make their firm appear “progressive” to consumers is a website. While it is still necessary for funeral homes to have a web presence, it is even more necessary today to have the right kind of web presence. The typical website today is static and no longer qualifies as progressive technology; that’s so “20th century”. The face of the newest technology in web design is the dynamic website. It allows web pages to be generated and updated in real-time and provides visitors a unique ability to communicate directly on the website. It is already the expected standard with many web users. Unfortunately, the mere act of adding a new name to your funeral home’s obituary page does not make the site dynamic. To help give you a clearer understanding of the differences of these two platforms, how many of us funeral directors have had visitors arrive at the funeral home to attend a service that already took place? Just because the visitor showed up at the funeral home does not guarantee they will be attending the funeral. Just because you have a website does not guarantee it will be generating traffic, especially if it does not provide you with tools to advertise your site, or visitors the technology to interact with it in ways that encourages them to remain on your site once they are there. The social networking sites of Facebook and Twitter are examples of dynamic web design. As new information is published by a user on these sites, their “friends” (people who want to receive their information) can immediately view it in real time. Users can even send and receive information via their cell phones. In many communities today, the printed daily paper has either cut back to just a few days per week or has been eliminated altogether. To help fill this obituary notification void, we use the power of social networking sites to subsidize the reach of the obituary notice and drive traffic to our funeral home site where visitors can view the complete service details, as opposed to the unthinkable—sending visitors to a third-party obituary website. Social networking sites are not meant to replace your firm’s website. Instead, it is well-suited to enhance the delivery of your messages. Since these sites are viral in nature, where news and information can freely spread among users, it makes them an excellent medium for your public relations endeavors. During a recent major interior makeover of our facility, I took photos throughout the project and posted them on our Facebook page. This enabled our Facebook “friends” to see the changes and follow its progress. Many users who saw the photos also left us comments of the changes, providing us with immediate quantitative analysis, further legitimizing the investment we made. This is merely one example. The usefulness of social networking sites is limited only to your ability to explore new ideas. The popularity of social networking sites is through the roof. That, and the fact they are free, are driving forces for why we use them. It only makes sense to go where the consumers are. With the right information and plan of action, your funeral home can see real and immediate results while being considered a progressive firm in the 21st century. New social media site for professional funeral directors, Connecting Directors, launches and in its first blog entry names Wakeman Funeral Home as a leader in the industry for the use of Facebook and other social media. The reference was to demonstrate to other funeral homes how social media can help promote their businesses and use it as a tool to provide information to consumers. With the lack of daily printed news in the region, coupled with social networking use on the rise, our funeral home has used sites such as Facebook and Twitter to help families announce obituary information to the community. Once again, we have pioneered the use of technology in ways no other immediate Saginaw-area funeral home has begun to use. An article by The Saginaw News explains why and how we now use social media. Saginaw area funeral homes use Facebook, Twitter to connect with community. Our participation in the WNEM-TV5 on-air obituary notification project has garnered more national press as national television media publication Broadcasting & Cable, wrote a piece on the new and emerging service derived from our participation in the project. WNEM's parent company, Iowa-based Meredith Corp., is expanding the technology to other markets. Wakeman Funeral Home launches new, interactive website. In light of our local daily newspaper scaling back their publications to three days per week, our local CBS affiliate WNEM TV5 asked our firm to help them with a groundbreaking project. For several months our firm worked directly with the television station as a consultant. It was determined that the longstanding tradition of newspapers providing death notices and obituaries meant that senior citizens were especially affected by the lack of the daily publication. The oldest members of our communities were less likely to be able to retrieve the information from the Internet alone. The project included building a brand new mechanism to allow funeral directors to upload specific elements of an obituary directly to the television station for airing in a secure way. The program also included more complete obituary information to be placed on a webpage. As the project moved forward, WNEM then used our firm as the initial conduit to help promote and demonstrate this new service to our colleagues across the WNEM broadcast area. In August of 2009, the project went live as the first death notices appeared on air. News of this new service reached across the state of Michigan and across the country as various business, news industry, and advertising communities ran stories of this new medium for obituaries. One such article appeared on dailyfinance.com as an emerging service for broadcast television operators. Local television station ABC 12 interviews Rodney Wakeman on the funeral webcasting service. Our webcasting story was picked up by the USA Today as written on the funeralOne blog. USA Today - Webcasting with funeralOne is “Almost Foolproof” | Funeral Blog. News about our funeral webcasting service was published by the Chicago Tribune and aired on WXYZ-TV Detroit. Several client families have experienced situations where other members of the family cannot attend the funeral of their loved one due to gas prices, airline costs, work schedules, and a variety of other reasons. In the fall of 2008, we began offering funeral webcasting, enabling these family members to participate no matter if they are on the other side of the state or the other side of the world by viewing the service over a private Internet connection. Over the past several months Wakeman Funeral Home, Inc. in Saginaw has taken steps to upgrade their service offerings to their clients. Many of these new offerings come from requests made by consumers. While making a recent upgrade to the obituary section of their website, ﻿www.WakemanFuneralHome.com﻿, it was determined to be the ideal time to integrate other new technologies into their service offerings. The firm has established a whole new suite of technological services and is now available to their clients. “These new services include individual, personalized Interactive Websites, which is in addition to our primary website,” said Funeral Director and Co-owner of Wakeman Funeral Home, Inc., Rodney C. Wakeman. “The Interactive Websites have five separate modules to encourage family and friend interaction, all to perpetuate the memory of the loved one,” he added. “Once the site has been established it can be accessed via the Obituary page of our website where the public can view it,” said Brian D. Wakeman, Co-owner and Manager of the firm. “If, however, the family wishes to keep interaction with the site private, only among family members, it can be done,” said Rodney Wakeman. “Otherwise, family, friends, business people, community contacts – anyone who knew the deceased can interact with the site accordingly,” he explained. Some of the features include lighting a candle and providing a short message in memory of the deceased, uploading photos to a personalized Photo Album, writing a memory in the Share Memories module and accessing a Video Tribute – a slideshow of photos set to music if one was requested by the family. “Soon, a Family Tree module will be available, allowing family members to build a family tree,” said Rodney Wakeman. “The family is given administrative control of the site. Any additions and deletions are administered by the family,” Wakeman added. In addition to these services and at the foundation of this newly-offered technology, the funeral home is providing webcasting through video streaming over the Internet. “Technology is everywhere,” said Rodney Wakeman. “We are now uniquely positioned to further help our clients with the loss of their loved one through the use of this specialized technology,” he added. “Consumers use technology in most every application in their lives; from televisions to computers to cell phones. Technology is no longer a luxury. It is a must-have. To include technology, even webcasting, as an integral part of a funeral has already been identified by families as the piece that had tied absent family members together and brought them into the important family event," Wakeman noted. “The same technologically savvy consumers who seek computers, cell phones and the like also have funerals. It is natural to incorporate what is already in our daily lives onto these services,” Brian Wakeman added. The firm has used the new services for a number of funerals already. Each time the funeral directors have explained to their families what they are capable of doing for them they have been extremely receptive of it. “It has been our experience that once our clients understand its purpose and how the technology can be applied to the service, they fervently embrace it,” Rodney Wakeman explained. “Nearly each family we have talked to about the technology had a situation where relatives or close friends were unable to make it to the service. When we told them of the webcasting service and that we could record the funeral and upload it to a website for later viewing, the families were relieved to know the others could still participate,” Wakeman said. "In one situation, a widow’s grandson, who is in the US Military stationed in Iraq, was unable to attend the funeral of his grandfather. In that instance we provided a live Webcast of the service in the event the grandson could log on at that hour and watch in real time. Otherwise he could view the recorded delayed webcast when it was more convenient," explained Rodney Wakeman. “It is clear we are exceeding our clients’ expectations,” Brian Wakeman added. “Some of these features have come from client suggestions. This is clearly business responding to consumer demand,” Wakeman noted. The funeral home has embraced technology for many years. In 2001, Wakeman Funeral Home was the first funeral firm in Saginaw to offer a website for consumers, and the first funeral home to offer obituary listings online to their clients. "The step up to webcasting and the Interactive Webpage was just a matter of time – time to make certain we are providing a quality service to our clients,” concluded Rodney Wakeman. Brian and Rodney Wakeman together own and operate Wakeman Funeral Home, Inc. They purchased the firm from their father, Harold, upon his retirement in 1999. The firm was established in 1911 by Balthas Gugel then purchased from the Gugel family by Harold Wakeman in 1965 before selling to his sons. Harold passed away in March 2008. To view a sample of the webcasting service you may log on to the obituary section of the funeral home’s website at www.WakemanFuneralHome.com. You may also reach them at (989) 752-8531 for more direct information.